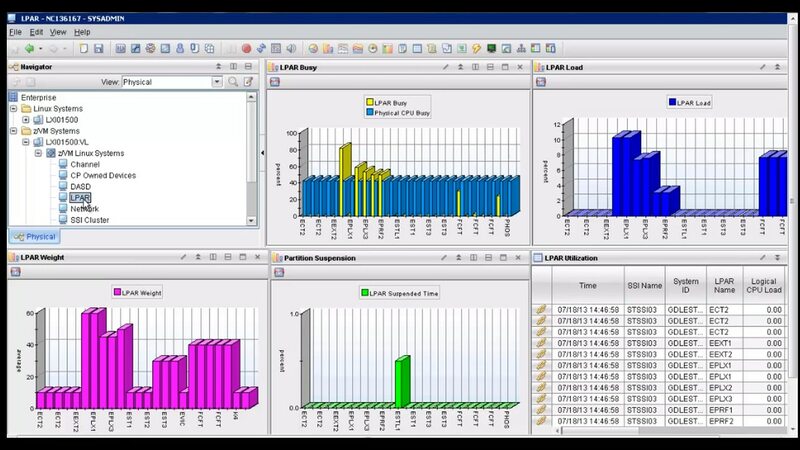 View z/VM data from the Performance Toolkit for VM with Linux on IBM Z systems performance data to resolve issues and manage a complex environment more easily. IBM Tivoli® OMEGAMON® XE on z/VM® and Linux® enables you to view z/VM data pulled from the Performance Toolkit for VM alongside views of Linux on IBM Z® systems performance data. This multiple view capability helps you solve problems more quickly and manage complex environments more effectively. View Linux operations data side by side with detailed performance metrics from other important systems to understand and resolve issues quickly. Use data from the Performance Toolkit for z/VM (a prerequisite for this product) with data collected by the IBM Tivoli Monitoring agent for Linux on Z systems to evaluate system performance. Navigate more easily between Tivoli Enterprise Portal workspaces using Dynamic Workspace Linking. View and monitor workloads for virtual machines, groups, and LPARs and view reports on z/VM and Linux resource usage, such as CPU utilization, storage, mini-disks and TCP/IP. Help your stakeholders understand how systems performance influences business and the bottom line. Use granular views to more easily track complex problems that span multiple applications, platforms, and systems and share related information.